It all started with a brief conversation at the tail end of a recent Dare County Board of Commissioners (BOC) meeting. At the January 7 meeting, commissioner and former Kitty Hawk councilman Ervin Bateman floated the idea of renaming the new Bonner Bridge structure after another prominent county citizen, Marc Basnight. After some discussion, the Board of Commissioners decided to take the decision out of their own hands, and to pose the question to the public. An online form was created so that members of the community could submit their input and suggestions, and the results will be tallied and reviewed at an upcoming BOC meeting on February 4. Since the form was released to the community at large, virtually everyone has been engaged in the Bonner Bridge naming debate. Social media sites have been a hotbed of activity for the topic, and the Outer Banks Sentinel reported that the Manteo Board of Commissioners approved a resolution on Jan. 16 requesting that the new bridge be named after the former State Senator, Marc Basnight, which sparked even more heated conversations. So what’s in a name? Apparently quite a lot. 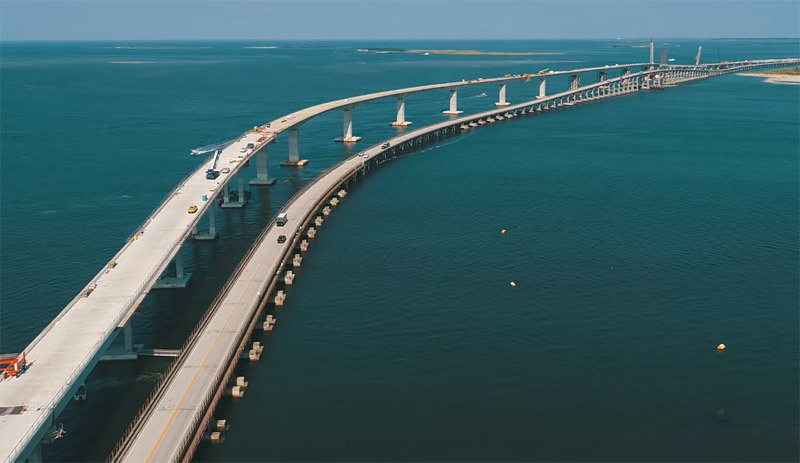 The question of whether to rename the Bonner Bridge arguably first appeared in a September 27 story in the Outer Banks Voice, with the majority of commenters supporting the idea of keeping the Bonner Bridge moniker the same. Based on input and feedback from the Hatteras Island community, it seems that many islanders feel the same way, although several people have suggested naming the bridge after the original ferry captain, Toby Tillet, who first provided transportation across Oregon Inlet to the island’s earliest residents and visitors. But regardless of preference, many folks feel a strong connection to the bridge – and a strong connection to its name – which is exactly why the bridge’s official name is spurring such impassioned discussion. On January 23, Dare County Public Information Officer Dorothy Hester reported that since the form went online on January 11, the county had received roughly 400 submissions. This seems like a lot, until you realize that the population of Dare County is roughly 36,100, (according to the latest statistics from the U.S. Census Bureau), and these 400 submissions account for about 1.1% of the overall county population, and roughly 10% of the year-round Hatteras Island population alone. Herbert Covington Bonner was a Democratic U.S. Congressman for North Carolina from 1940 until 1965. Born in 1891 in Washington, North Carolina, Bonner served in the United States Army as a sergeant during World War I, and later as secretary to Congressman Lindsay Warren from 1924 to 1940. He was Warren’s eventual successor, and served twelve full terms in Congress from 1940 until 1965 – a tenure of roughly 25 years. During this time, Bonner chaired the Committee on Election of President, Vice President, and Representatives in Congress, and also chaired the Committee on Merchant Marine and Fisheries. Along with Warren, Bonner supported the establishment of the Cape Hatteras National Seashore, as well as the federal programs by Roosevelt and Kennedy to enhance the park. This same publication also notes Bonner’s role in creating the 1963 bridge to begin with. Bonner passed away on November 7, 1965, but both he and Warren were reported to consider the Bonner Bridge one of the biggest achievements of their lengthy careers. Marc Basnight served as a Democratic member of the North Carolina State Senate for the 1st District from 1984 through 2011. Basnight was born in Manteo in 1947, and graduated from Manteo High School in 1966. Basnight chaired the Dare County tourism bureau from 1974 to 1976, was a member of the North Carolina Board of Transportation from 1977 to 1983, and is still famed for his local restaurant, the Lone Cedar Café. Basnight also has a key connection with the Bonner Bridge, and was a staunch supporter of the Bonner Bridge replacement for years. Holding the influential position of President pro tempore from 1993 until the Democrats lost their Senate majority in the November 2010 elections, Basnight made multiple efforts throughout the years to move the replacement project forward – long before the new bridge broke ground in March of 2016. The Island Free Press’ co-founder and editor, Irene Nolan, detailed one of these efforts in a February 26, 2010 article. “In a letter sent this week, Marc Basnight, the powerful President pro Tempore of the state Senate and a Manteo Democrat, urged President Barack Obama to end the ‘bureaucratic standstill’ that has stalled the replacement of the aging Herbert C. Bonner Bridge over Oregon Inlet,” the article reads. Before there was a new – or original – Bonner Bridge, there was Toby Tillet. Access to Hatteras Island via ferry began when this Wanchese commercial fisherman started towing cars on a barge that was tied to the back of his fishing boat in 1924. The initial 30-foot barge could hold two cars at a time, but by the end of the inaugural year, Tillet had replaced the barge with a 45-foot long ferry boat that was called, appropriately enough, the Oregon Inlet. In 1928, Tillet set a schedule for regular trips so that visitors and islanders could plan their crossings accordingly, and in 1931, he enlisted a new vessel, the Barcelona, which was constructed for him by local boat builder, carpenter, and fisherman, Rocky Rollinson. Now able to handle up to 14 cars per crossing, Capt. Tillet continued his ferry service until he sold his business to the North Carolina Highway Department in 1950, which later canceled the ferry altogether once the 1963 Bonner Bridge was completed. You could easily argue that Tillet helped launch the initial interest in Hatteras Island as a vacation spot years before the idea of a bridge was first proposed. Operating the ferry for more than 25 years, it was Tillet who first connected the island with the outside world, allowing locals to expand their charter fishing and hunting guide businesses, and allowing outsiders to discover this remote stretch of shoreline in the first place. And many people who have deep roots on the island see plenty of value in honoring this connection. But regardless of your personal preference, the best way to get your opinion heard is to share it with the county. Despite your opinion on what the name should be, (and opinions are certainly running strong), you have to hand it to the Dare County Board of Commissioners for basically stepping away from the decision, and leaving it up to the public to decide. You can still submit your name recommendations before the January 31 deadline, and can do so via the county’s online form here: https://docs.google.com/forms/d/e/1FAIpQLScvZpIllIQk76DqdpkYugqxC7vuVrgx4429Z08BdKp2B6qH0Q/viewform. As mentioned, the public responses will be reviewed on February 4 at the BOC meeting, where we’ll all learn more about the next steps towards changing – or keeping – the name of the new Bonner Bridge. The form should have been a list of choices and not open ended. Besides who wants to spend time describing this individual’s significant contributions and accomplishments at the local, state, and/or national level. Keep it simple and name it the Oregon Inlet Bridge. It is simple and can’t be attacked in the future when society’s norms change and what was acceptable behavior or stances on issues today no longer is so. There is near zero potential for future controversy when place names are used. I doubt the county will do anything with the generated list other than thank those who completed the poll. This will definitely be true if the most popular name is not one they want.